Can Varicose Veins Cause Pain? Can you see large rope-like knots of veins on the surface of the skin? If so, that means you currently have varicose veins. Varicose veins and spider veins — two similar but slightly different conditions — occur as a result of vein disease. However, of the two, varicose veins carry some of the more serious consequences. Now, you must be wondering, can varicose veins cause pain? Varicose Veins can cause pain and discomfort either standing or sitting. They are a result of venous insufficiency — a potentially dangerous vein disease — and can cause a lot of harm if left untreated. The best way to cure varicose veins is to see a vein doctor in New York or vein doctor in New Jersey. Here, at Vein Treatment Clinic, we offer the most advanced treatment options to cure varicose veins and make them go away. Varicose veins are a large swollen blood vessels visible on the surface of the skin. They often bulge out of the skin and appear dark purple, blue, or red in color. Varicose veins are most commonly found in legs, but they can also appear in the inner thighs, buttocks, and lower pelvic areas. Unlike healthy veins, which usually run in a relatively straight line, varicose veins usually follow a twisting, turning, path. Spider veins are visible on the surface of the skin but they don’t bulge out. They take the appearance of spider webs or tree branches. They are red in color. Usually formed in the legs or face. 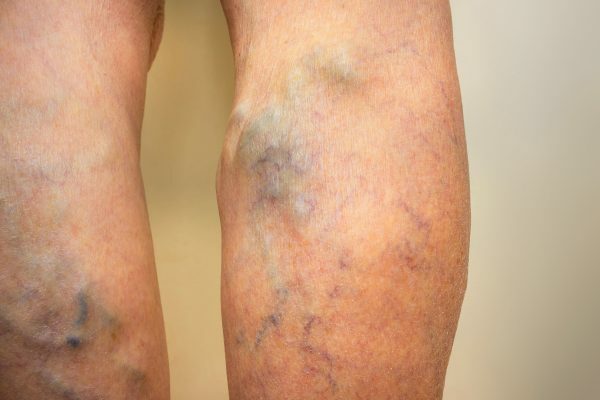 Spider veins are usually not as painful as varicose veins. They can be a symptom of vein disease, which makes treatment essential. But they don’t directly lead to serious medical conditions like skin ulcers and bleeding. Varicose veins are a lot more painful and dangerous than spider veins. Vein disease, known to doctors as Venous Insufficiency, is the primary cause of varicose veins. Venous Insufficiency occurs when your veins stop functioning correctly. The valves in your veins act as one-way doors from which blood rises up to your heart instead of flowing back down to the feet. However, if these vein valves malfunction, the blood flows back and the veins in the lower legs are flooded with blood. Over time, pressure builds up in these veins and leads to the formation of varicose veins and spider veins on the surface of the skin. Venous Insufficiency itself causes pain, with or without visible veins. The pain from venous insufficiency is frequently described as a dull ache, or a sensation of heaviness in the legs. This discomfort is usually worse at the end of the day, especially if you have spent the day sitting at a desk or standing. Exercise may help this discomfort, because exercising squeezes the calf muscles, helping push blood up to the heart. You may experience cramping in your legs, or restless leg syndrome due to venous insufficiency. Many people think pain from vein disease is part of the normal aging process, rather than a condition that can be treated. Varicose Veins can cause pain and lead to a number of other medical conditions as well. The following are some of the major complications of untreated varicose veins and venous insufficiency. Swelling: Your legs can start swelling due to the pooling of blood in your vein walls. This can cause both pain and discomfort. Skin Ulcer: As the swelling grows, your skin is less likely to heal from small injuries. This can lead to non-healing skin ulcers. Infection: When the tissues are stretched out from the swelling, they are less capable of defending against bacteria. As such, the bacteria from our skin can get into the body and cause a skin infection called cellulitis. Bleeding: Since a lot of blood is collected in a single vein and the skin is sensitive due to swelling, even minor injuries will lead to considerable bleeding. Deep Vein Thrombosis: Sometimes, blood clots may form within the varicose veins. This leads to a serious medical condition called Deep Vein Thrombosis. If the blood clot breaks and is carried to the lungs, it can lead to a potentially fatal medical condition called Pulmonary Embolism. As you can see, not only can varicose veins cause pain, they can even be potentially fatal if left untreated. How to Cure Varicose Veins? Varicose Veins need to be taken seriously for all the previously mentioned reasons. If you notice any of the symptoms of varicose veins, consult your local vein doctor in NY or vein doctor in NJ. Here, at Vein Treatment Clinic, we have successfully treated numerous patients in advanced stages of venous insufficiency and varicose veins. You can consult our doctors for a detailed recommendation — one that is tailored for your specific case — on how to cure varicose veins. Before you read any further, you need to know that home remedies CANNOT cure varicose veins. You might find a lot of misleading solutions online, but it is necessary to see a professional vein doctor to treat varicose veins. Having said that, the following are some home remedies that can at least lessen the symptoms of varicose veins temporarily. Compression Stockings: They are stockings that apply pressure on your blood vessels, encouraging healthy blood flow. While they might slightly control the situation, they cannot cure varicose veins completely. Furthermore, you should consult your local vein doctor to be fitted for compression stockings. Exercise: Regular exercise can help with healthy blood flow from the legs. However, this is more of a preventative measure. If you already have varicose veins, exercising more won’t have much of an impact. The only permanent solution to varicose veins is to consult a reputable vein doctor, called a Phlebologist, and come up with a treatment plan. At Vein Treatment Clinic, we have a number of certified Ivy-league doctors that can carefully examine your symptoms and cure your varicose veins with minimally invasive treatments. We work along with VIP Medical Group and have a spotless track record for successfully curing all our patients’ varicose veins. However, a specific treatment plan for varicose veins can only be determined after close inspection of the affected veins. So it’s important that you go to your neighboring vein doctor in NY or vein doctor in NJ and consult them today.